This weekend sees the glorious return of possibly the greatest rivalry in Scandinavia as FC Copenhagen ‘welcome’ Brøndby IF to their PARKEN home. It will be the first time in two years Brøndby fans are to fill their seat allocation after a number of incidents over the past 24 months. Indeed, this New Firm derby – a name taken slightly in jest and also great reverence from the Old Firm between Celtic and Rangers – is often the fixture most Danish neutrals look for when the list is produced each summer and recent clashes have certainly lived up to their billing. The idea of a derby in Denmark is rare considering the nation is so small. There are few high-intensity clashes like that in England or Scotland due to relative small sizes of the Superliga’s clubs; yet FCK and BIF are two behemoths in Danish football and fans come together in support of their team when derby day comes along. Indeed, so popular is the clash that Copenhagen have already sold 30,000 tickets for the game – almost double what they usually draw for a home league fixture. The match has received even more attention because Brøndby fans are expected to fill their 5,000 away end: something they haven’t done in the past two seasons. For after a number of crowd incidents during Superliga games, the league reached a turning point in 2010 when BIF fans set alight parts of the Copenhagen terrace to entertain themselves during a 2-0 defeat. Flairs, smoke and seats filled the air in generally distasteful scenes unwanted at football games in this century. BIF were banned from taking their main support to PARKEN for the next couple of fixtures, while FCK have also suffered repercussions from crowd behaviour in recent times. Earlier this year the league decided to nip the problem in the bud before it could properly flourish and infest the Danish game, with six of the top 12 clubs agreeing to regulations on their away support in order to make football a more family-friendly environment. This has worked to some extent and now Brøndby fans are allowed back to PARKEN in full voice for the Derby – although they must behave themselves. And what a game it should be. Paralleling Celtic and Rangers, the country’s two top clubs are currently experiencing differing fortunes. While Copenhagen go from strength to strength and have a three-point grip on the league, Brøndby are suffering financial implosion and after selling their best players in the summer sit bottom of the Superliga. As we all know, however, form means nothing on Derby day and Brøndby will head to PARKEN with as much expectation as ever before.As is the freak nature of the Superliga fixture list, the clubs have already met in PARKEN once this season and a 1-1 draw was a fair result. Copenhagen had taken the lead in a tight game through new signing Nicolai Jørgensen, who nodded a well-worked move into an empty net to immediately endear him to the FCK support. Yet with six minutes remaining Brøndby deservedly struck back thanks to a sweet Clarence Goodson strike, levelling the tie and setting this weekend’s encounter up as a must-win victory for the capital’s bragging rights. Sunday’s New Firm Derby will pit one team desperate to reclaim the title they lost last year against one battling to survive in the top flight. A Brøndby relegation is unthinkable in Danish football and the repercussions of their fanbase not being in the Superliga is something Scotland are now experiencing with the exile of Rangers. 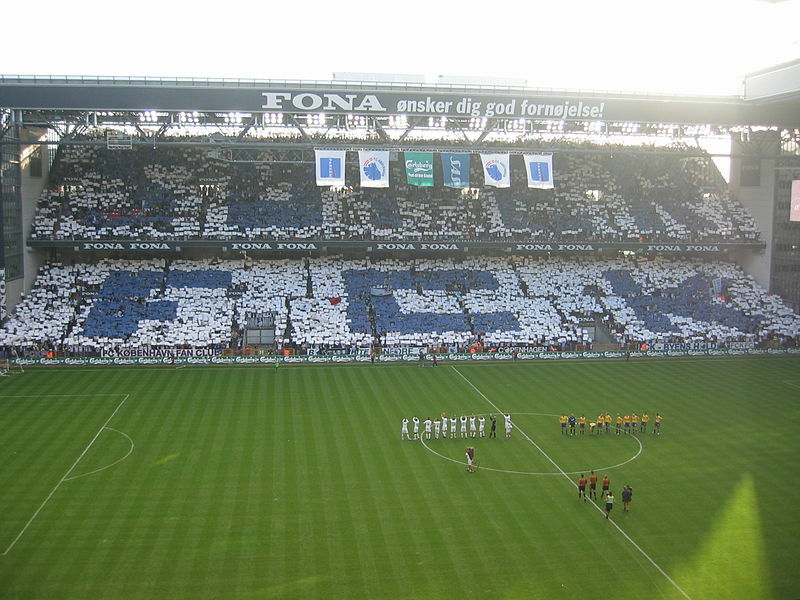 For the good of the national game many neutrals will be hoping Brøndby cause a huge upset and take all three points this weekend but FC Copenhagen have a mission statement to fulfil this season and no one looks likely to get in their way. This entry was posted in Previews and tagged bif, brondby, fc copenhagen, fck, new firm derby, parken, superliga by The False Nine. Bookmark the permalink.